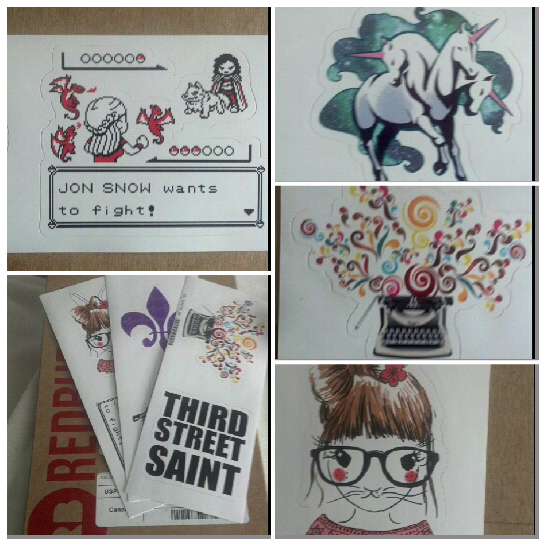 Item #1: Vinyl Stickers from RedBubble! Not sure if I've said it before, but you've got to love this site! RedBubble is a site where you can order various t-shirts, prints, and even iPhone cases. The big focus of RedBubble is all the products on the site have art made by original artists. The main reason I visit the site so regularly is not only because of the many geek-themed products that are to be found, but I tend to order their high-quality vinyl stickers. Because of what they're made of, you can put these stickers on the back of your laptop, the windows of your car, on furniture and even directly on walls without risk of damage. Even better yet, when you buy 6 or more stickers, you'll get all of them for 50% off! More often than not, because of this deal, I buy at least 6 stickers whenever I place an order. Foer this particular order, only one of the stickers is actually intended for me, and that would be the beautiful typewriter sticker with all the coloured swirls surrounding it, which you can see on the right-middle panel in the image above. Along with that, two of the stickers are intended for my mom's boyfriend's birthday gift, and those would be the 2 Saints Row themed stickers you can see in the bottom-left image. 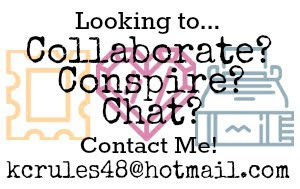 The other two images on the right, the three-headed unicorn and the cute bunny are gifts that I've intended to send along to the two vloggers I plan on writing to, as I have discussed in an earlier post. The one on the left is but one part of a large package I am putting together for my pen pal's birthday gift. 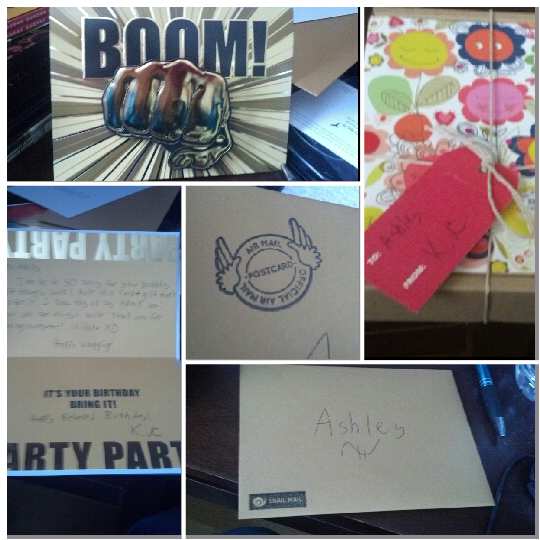 For my past birthday in August she positively spoiled me with gifts. Well, two can play at the Birthday game, and it is now my turn! I'm not sure if her gifts will arrive on time, but I'm only awaiting one more part of her gift to arrive, then I can put everything together and send it out! Item #1: Belated Birthday Gift to Fellow Vlogiggle Ashley! Ashley lives in Hong Kong, and her birthday was January 1st. Needless to say, this gift will be arriving very late. Nevertheless, I put together what I hope will be a nice gift for her, finding an awesome birthday card and including a box of pretty Thank You cards in the package. I wrote in her card that a good way to use these cards would be to write inside of them "Thank You . . . For Being Awesome!" That way she'll get a lot of use out of them. Fellow vlogiggle Emy has a birthday coming up soon as well, and I have a similar gift prepared to send to her. Item #2: Wit&Whistle Card to The Guy I'm Dating! Maybe to some it might seem off that I'm writing to somebody that I see in person on a semi-regular basis, but I have legitimate, non-clingy reasons why I decided to send a card to the guy I like. And it very much goes along with the entire notion of this blog. So many people in 2014 have forgotten about the simple pleasure of receiving something in the mail that isn't some sort of bill that needs to be paid. The guy in question is very much in the same boat. When I asked him about the last time he got something in the mail that wasn't bill related, he had a hard time remembering an exact moment, thinking that it could possibly have been many years ago. Since things have been going so well between us for the month or so that we've been seeing each other, I decided to take the leap and send him a card, where I wrote a simple enough message. 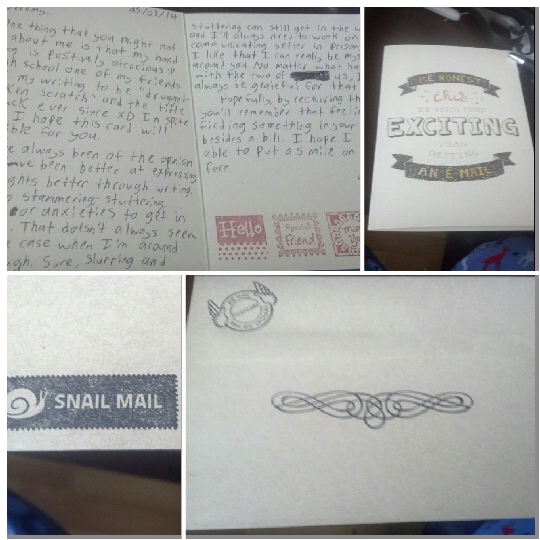 I also decorated the envelope with a few stamps, but nothing too girly or obnoxious. That's about it for now! I'll be sure to keep you guys posted.